How much do you need to know about the writer to be able to enjoy their books? Nothing at all, according to Elena Ferrante, author of the Nepolitan Quartet and other books. She writes under a pseudonym and refuses to reveal her identity, insisting that her books can speak for themselves. The media hates a mystery and has turned this into a circus, with an Italian journalist claiming to have tracked down the real Elena Ferrante. Rumour even had it that she was really a man—how could a mere woman write these brilliant books? But while journalists fretted over her identity, people kept reading her books: the sales figures speak for themselves. In this book, she reveals something of the woman behind the books. This frantumaglia (a jumble of fragments) is a collection of her interviews over the years—always by email—and her correspondence with film directors. But there are rewards for those—both journalists and directors—who engage directly with her writing. This is where she shines, describing how a story comes into being and takes shape. 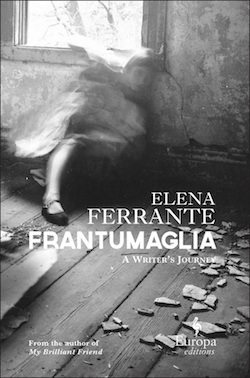 Ferrante is a perfectionist—until she is entirely satisfied, her writing stays private. This means that she has written more than she has published. Good writing, she believes, should say “the unsayable”, tackling issues that are often swept under the carpet. She has no time for “correct” stories, especially by women: “Better to make a mistake with the incandescent lava we have inside…than to assure ourselves success by resorting to murky, cold finds”. The interviews are wide-ranging, and I cannot really do justice to them in this short piece. Ferrante speaks perceptively about Berlusconi (this was when he was Prime Minister), and how and why people engage with politicians like him—an issue that is still relevant today with the rise of populists. She discusses psychoanalysis and women writers, and her difficult relationship with her mother. The often fraught relationship between mothers and daughters is a theme she keeps coming back to in her books. Because her responses to questions are in writing, the portrait that comes through is not filtered through the eyes of another person, and you get the full force of her writing. Here is Ferrante describing her mother, a seamstress, work: “The mobile skill of that hand put together the pieces of material, made the seams invisible, the pieces of fabric regained a soft continuity, a new compactness, became a dress, the shape of a female body”. Not very different from what a writer does. Elena Ferrante comes across as fiercely individualistic, thoughtful and eloquent—all the characteristics that make her novels such a pleasure to read. I read this book cover to cover, and I’m not sure that’s the best way to read it. As I said earlier, some of it can be a bit repetitive because journalists tend to ask similar questions. And some of it can feel a bit long when you haven’t read the book she is referring to. But she is a pleasure to read, and I would recommend this book especially to writers. To end with the big question: how much does a reader need to know about the writer to enjoy a book? I think Ferrante is right: good writing does not need the author to promote it. After all, we can’t really “know” an author—all we get are a few fragments of their lives upon which we build our image of them. So why do we need to know anything at all? I remember reading Wilfrid Owen’s poem Dulce et Decorum Est for the first time when I was 15. The power Owen’s words stunned me, although I had never heard of him. Nothing I’ve learned about him since has changed the way I feel about that poem.